For anyone who does not imbibe, or for those who are struggling, please know that I do not want to encourage anyone to drink alcohol. But for those of my customers or followers who occasionally like a nice gin & tonic in the summertime (and you can put me in that column), this is for you. Did you know that gin is just infused vodka? High end gins (and there are many) infuse their own special botanicals, spices and fruits before performing a final distillation. But the final distillation is only to remove the color and particulates. Before that is done it is “compound gin” as long as the primary infused ingredient is juniper berry. So you pay an exceptional price for this artistry or artisan flair. But you can actually create your own compound gin by infusing these same selected botanicals at home. You will save money and create an incredibly delicious and fresh gin for mixing your cocktails. 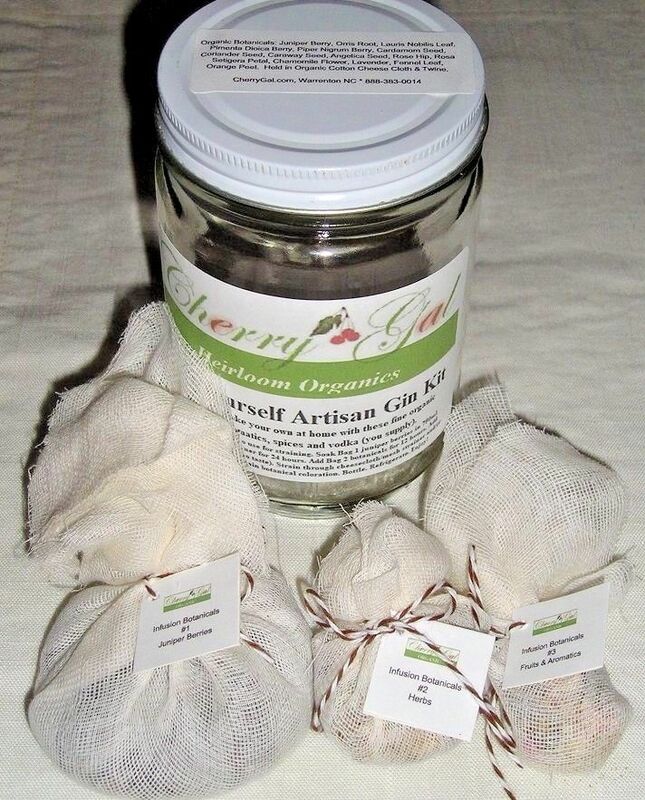 Now, you can go and purchase or gather these infusion ingredients yourself — and it is fun to do — but CherryGal Heirloom Organics has done the research and put together a great little kit for infusing a 750ml bottle of neutral Vodka which you will purchase. It is a fallacy that inexpensive vodka is inferior vodka. There are very good and inexpensive neutral Vodkas available, including UV, Deep Eddy, Svedka, Luksusowa, Finlandia and Sobieski. Just be sure you choose a clear, neutral vodka, since flavored vodka is also on the shelves. 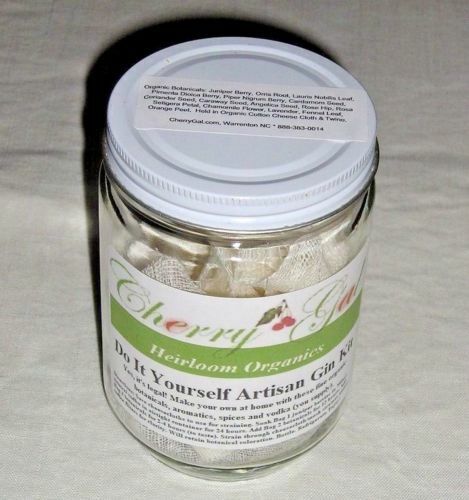 Another advantage to choosing a CherryGal Heirloom Organics Do It Yourself Artisan Gin Kit — and an important one — is that the botanicals are all organic. When botanicals are infused in alcohol, the alcohol extracts everything from the botanicals — the flavor, the fragrance, the color and, unless it is organic, any pesticides or chemicals used in production. Yeck! Using my kit you will achieve a beautiful, clear gin with a golden botanical coloration. So I hope you will give my new product a try. It is legal. It is fun. It is inexpensive (especially compared to Williams and Sonoma and others). And it takes about 5-10 minutes of your hands-on time and 36-48 hours waiting time. Available online at www.cherrygal.com or at the Warrenton Farmer’s Market each Saturday! Enjoy!